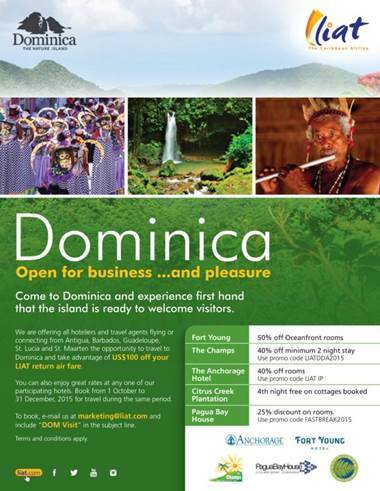 Roseau, Dominica – (October 15, 2015) Discover Dominica Authority has partnered with LIAT to launch discounted airfares to hoteliers and travel agents visiting Dominica between October 1 – December 31, 2015. Travel agents and hoteliers originating from Antigua, Barbados, Guadeloupe, St. Lucia and St. Maarten are eligible for US$100 discount off a return fare flight to Dominica. In addition, five Dominican hotels are offering reductions on hotel rooms ranging from 25 – 50 per cent off their regular rates. 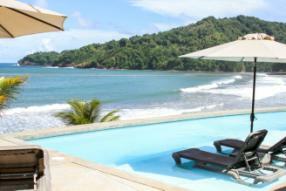 Hotel specials are available from the Anchorage Hotel, Citrus Creek Plantation, Fort Young Hotel, Pagua Bay House and The Champs. This initiative is just one of the many collaborative efforts between Discover Dominica Authority and regional carrier, LIAT, to facilitate travel for promotional purposes. In July, LIAT carried Barbadian professional surfer Brian Talma’s to Dominica for Dive Fest activities from July 17 – 20, 2015. The airline also assisted with the travel arrangements and transportation of costumes for Miss Dominica 2015 to participate in the Miss Jaycees Queen Pageant held in Antigua on July 26, 2015 and the Miss Caribbean Culture Queen Show held in Nevis on August 6, 2015. “LIAT works closely with its main Shareholder Governments to facilitate their travel to key events around the region, to assist them in travel arrangements for visiting artists and to attract people to visit the island,” said a LIAT representative. Meanwhile Director of Tourism, Mr. Colin Piper sees this partnership as one that is mutually beneficial. According to Piper, “Air access is critical to facilitating travel of residents and visitors in and out of Dominica and LIAT has been willing to work with Dominica in this regard”. Roseau, Dominica – (October 15, 2015) “Dominica is open for business and ready to welcome visitors to its shores,” so says Minister for Tourism and Urban Renewal, Honourable Robert Tonge. This comes after the island was hard hit by Tropical Storm Erika on August 27, 2015. At a recent press briefing, the Minister provided an update on the status of the island’s tourism industry. Air access to the destination has resumed with LIAT, Seaborne and WINAIR offering daily flights between Dominica, from Antigua, Barbados, San Juan, Puerto Rico, St. Maarten, St. Thomas and St. Croix. Flights operate from the main airport – Douglas Charles Airport and the smaller one Canefield Airport which is 15 minutes from the capital Roseau. Road access has been greatly improved with the installation of three Bailey bridges along the west coast. Most roads are passable and access to the main sites and attractions is fairly simple. Popular sites like the Trafalgar Falls have been made even more breathtaking by Mother Nature, as well as the Emerald Pool and Middleham Falls. Visitors can also enjoy our black sand beaches at Mero and Purple Turtle, or visit the Kalinago Barana Aute in the east for an authentic Kalinago (Carib Indian) experience. 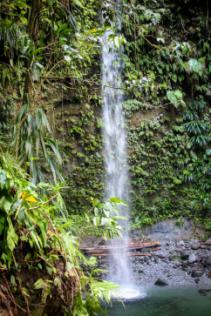 For the more adventurous nature lover, seven of the fourteen segments of the Waitukubuli National Trail – the Caribbean’s longest hiking trail, are open to hikers. Divers and snorkelers can continue to enjoy the picturesque dive sites along the north, west and south coasts; including the popular Champagne Reef with its underwater geothermal springs which produces the effect of swimming in a glass of champagne.